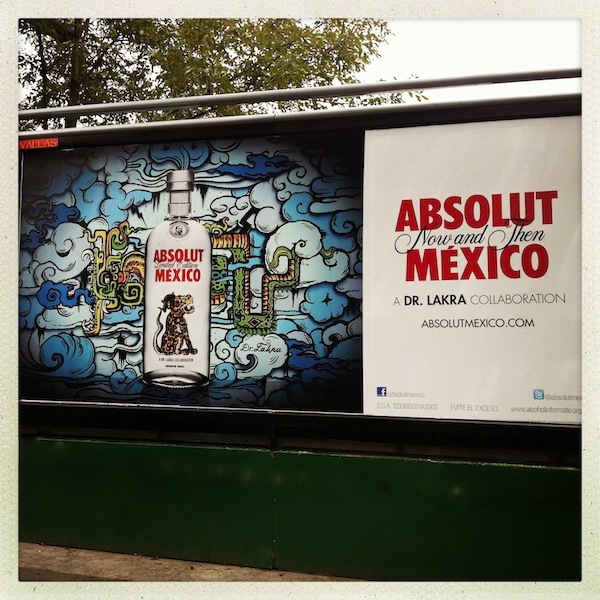 Out strolling in Mexico City, I came across the unmistakable work of my Oaxacan neighbour Dr Lakra jumping out from a billboard advertising Absolut Vodka. Absolut, have shown their innovative thinking on this one, employing the visual artist, tattooist and son of famous Mexican artist, Francisco Toledo to design the artwork for their latest limited edition bottles. Past limited editions have been made to represent different cities such as London, Brooklyn, New Orleans and Rio and now it is the turn of the majestic metropolis that is Mexico City. Lakra’s work is inspired by all areas of Mexican culture, from traditional Mesoamerican imagery and design, to Day of the Dead iconography, to kitsch Mexican wrestlers and pin-up girls. His work is often complex in detail and contains far more than first meets the eye. 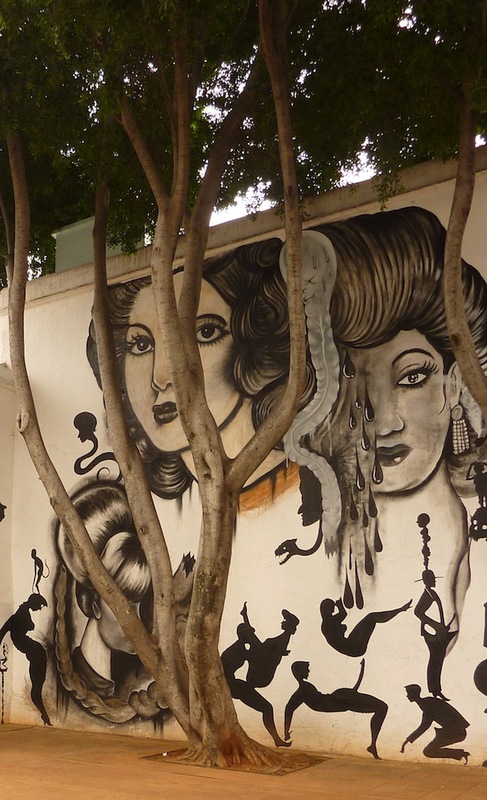 An example of this is his mural, currently adorning the courtyard of Oaxaca’s Museum of Contemporary Art (MACO), that contains a plethora of different, often contrasting images, shadows and outlines. It isn’t until you look closer that you notice images of couples in various acrobatic forms of fornication. Dr Lakra, who got his name from carrying a Dr’s briefcase full of his tattooing tools (Lakra is a play on the Spanish word lacra meaning scar), is one of most innovative and well known graphic, visual artists based out of Oaxaca, a city which boasts a veritable melting pot of graphic artists that provide commentaries about Mexican life, history and politics, through, stencils, murals and iconographic images. The bottle designs by Dr Lakra, show his love for his homeland, depicting three Mayan symbols, that he says represent “what he most likes about Mexico”. Balam, the jaguar and warrior, who illuminates the earth during the day and plays in the underworld at night, Kukulkan, the feathered serpent, conqueror and founder of the Mayan civilization and Hurakan, the god of the wind, storms and fire, (it is a little known fact that the word Hurricane derives from the name of this Mayan god). I am hoping to grab one of these limited edition bottles, because not only are they beautiful, I also wonder if there is any better way to toast the end of the Mayan calendar than with a bottle of Kukulkan inspired vodka! Hi, I am a restorer of old pottery and soon I’ll have a Lakra’s work to repair. So I am looking for some notices about him. WOW! That is amazing! I am glad you found the piece useful. Good luck with the piece!